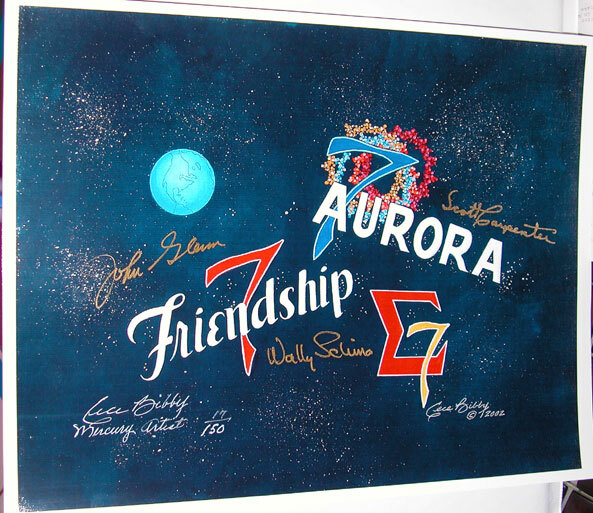 Artist Cece Bibby designed and hand painted onto the spacecraft, the logos for the historic Mercury flights of John Glenn (Friendship 7), Wally Schirra (Sigma 7) and Scott Carpenter (Aurora 7). Cece is the only American Artist whose work has orbited the Earth on three different missions! 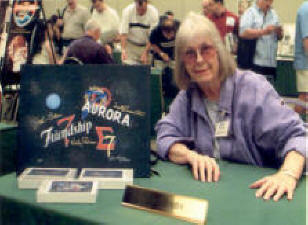 Her Mercury mission emblems for those flights have become their universal symbols and are known worldwide. 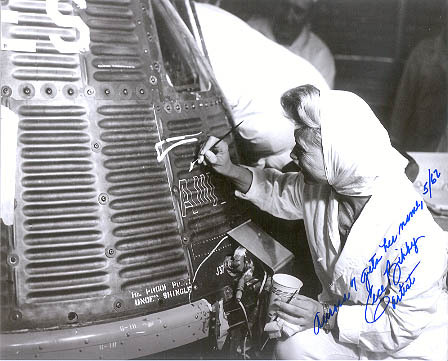 Cece was a very progressive woman for her time, working in the White Room side by side with the Astronauts and Padleader Guenter Wendt and his crew. This during a time when very few women were granted such access. 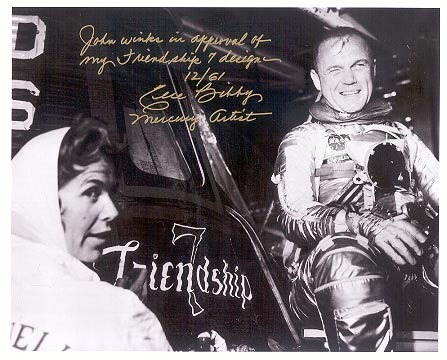 The Mercury Astronauts loved her because believe me, Cece could run with the best of them, and DID !!. I'm proud to say that Cece and I were great friends for several years and that all items on this page were hand signed by her exclusively for Farthest Reaches. Sadly she passed away November 12, 1012 at that age of 84. She is very missed by many. Check out the stories behind her famous logos by clicking on the link under each image. Reproduced from Cece's original painting, "Out Of This World", these high quality note cards measure 5.5" x 4.25". They unfold to a blank area for writing your greeting or sentiment. Packaged in a box of 8 with envelopes. While they last each box sold will ALSO include a 9th card and envelope hand signed on the card by Cece Bibby who adds "Mercury Artist". The photo in the scan shows the 9th card with Cece's origional signature added. The other cards are identical without this signature. This would make a perfect holdiay greeting card or could be used otherwise for any space enthusiast. These cards which represent Cece's "Space" legacy were produced for and offered through Farthest Reaches exclusively. These are the last remaining sets and when they're gone.....they're gone. Cece's autograph alone on this site sells for $45 so do the math and you'll see what a reasonable price this is for 8 cards with envelopes and a 9th that is hand signed and can be saved in your collection or sent to someone very special. 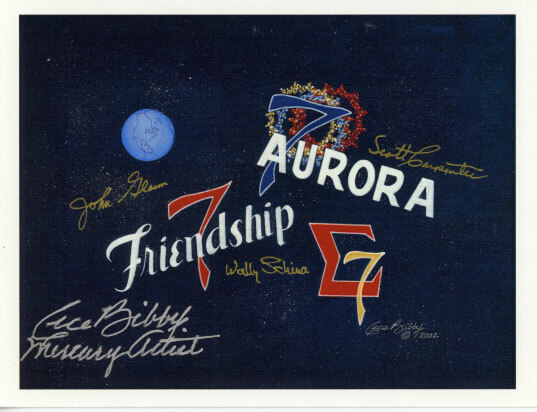 Friendship 7 - America's First Orital Art ! 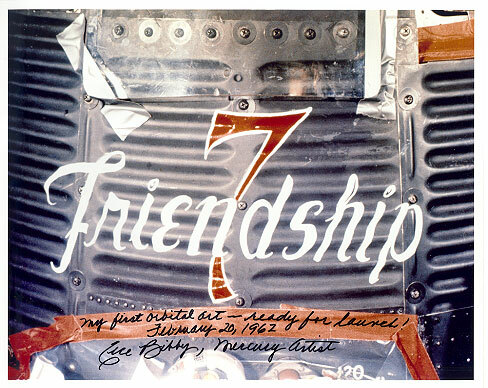 Periscope views for John Glenn (Friendship 7). Cece inscribes, "....almost ended my NASA carreer"
"...it included his favorite song !" 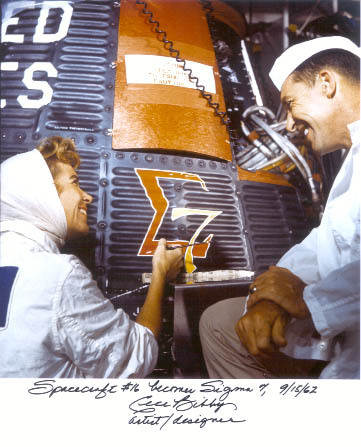 This was the practical joke played by Cece on Astronaut Scott Carpenter. 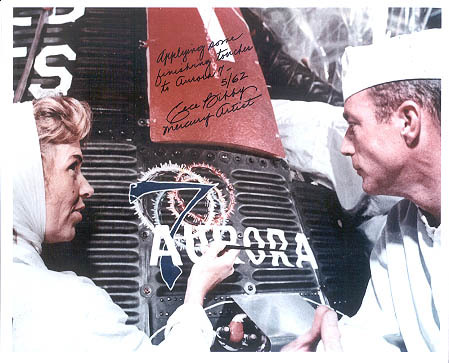 Signed by both Cece Bibby AND Scott Carpenter !! "....it included his favorite song !" 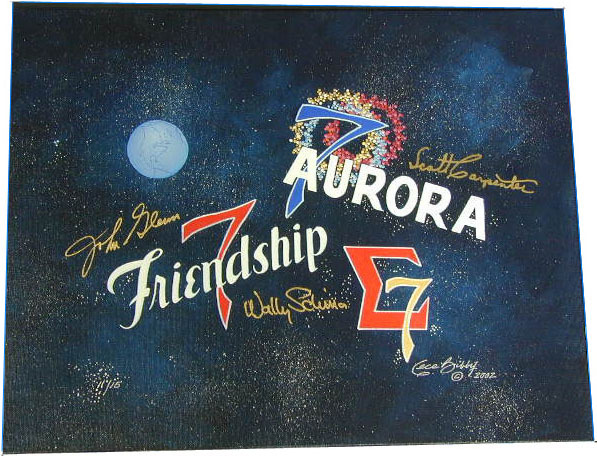 Scott Carpenter's "Aurora 7 gets her name"
"Applying some finishnig touches to Scott Carpenter's Aurora 7"
"Wally Schirra's Space Craft #16 becomes Sigma 7"
This 11" x 14" high quality print is reproduced from the original limited edition co-signed hand painted original. It's simply beautiful and perfect for those of you on a budget yet are enamored by this historic work of art. 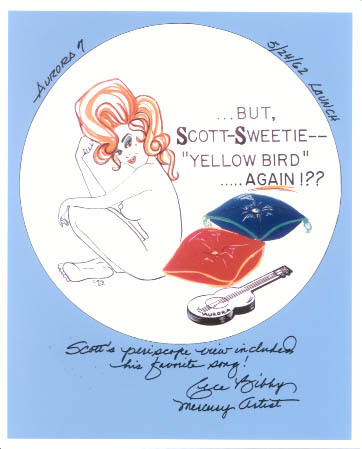 Making this even more desirable is that it's also a limited edition of 150 with each being numbered and authentically hand signed by Cece Bibby. Would look wonderful framed ! 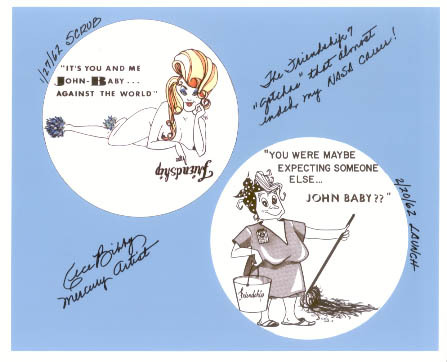 Some 40 years ago, Artist Cece Bibby sent three Marcury Astronauts into space with special emblems adorning their capsules that she designed and applied with her own hand. These emblems became known forever after as the universal symbols of those historic missions. Since that tinme and ntil 2002, Cece had not reproduced these mission emblems in any form whatsoever. This is the absolute first and only opportunity you will ever have to own an original painting of these three famous logos produced by the same hand that created them. They are faithfully reproduced to look just as they did to John Glenn, Wally Schirra and Scott Carpenter for their historic Mercury flights. You've seen them in photographs, on patches, on T - Shirts, pins, hats, jackets, books and magazines...but never like this. SPECIAL NOTE: These paintings were produced in two states. Each is an absolutely guarenteed, original hand painted acrylic on canvas panel painting and measures 14" x 18" and will come with a signed LOA from Farthest Reaches LLC.